Starfleet has access to transporter technology. Since the Rebel Alliance does not have this technology, it is fair to say they cannot defend against it. This makes it easy for the Federation to slip aboard Rebel ships for espionage, intel gathering, or assassinations. 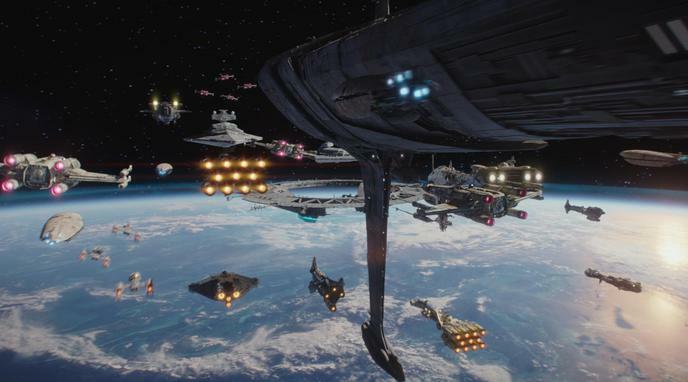 While the rebels might be able to defend against some transporter technology, the ability to transport supplies and personnel from surface to orbit in seconds is a vast advantage in terms of logistics and tactical mobilization. The Rebel X-Wing fighters, etc. would be useless as the pilots and droids could be transported out of them, causing them to become worthless in a fight. Federation technology has demonstrated the ability to transport entire shuttlecraft moving at high impulse speed. That is overly sufficient to simply transport fighters themselves out of the battle. They do not even have to be rematerialized, could just be diverted to the anti-matter supply to be vaporized. Transporter technology enables the Federation to be much more effective at boarding operations than the Rebels. examples of weapons being transported this way, for example photon torpedoes and grenades. Federation transporter technology appears to be reliable only under the best of circumstances, even when accidents happen. Things that can adversely impact transporter operations include: electromagnetic radiation, electromagnetic force fields, severe weather, dense metals, defensive shields, exotic radiation, natural minerals (all occurred at some point during the shows). In a combat scenario, with heavy jamming/electronic interference/shielding, transporter utility is suspect. In the Star Trek universe, individuals are unable to transport through a force field. Star Wars universe tech would therefore be adequate to defeat this advantage. Teleporters are notorious for not working when trying to teleport through dense surfaces or interference. During the episode "Hero Worship" a boy was behind several layers of metal and shields and was unable to be transported. It is easy to see a direct comparison to Star Wars ships.